I’m a big believer in homemade when it is better homemade. Homemade pizza is hard to beat! 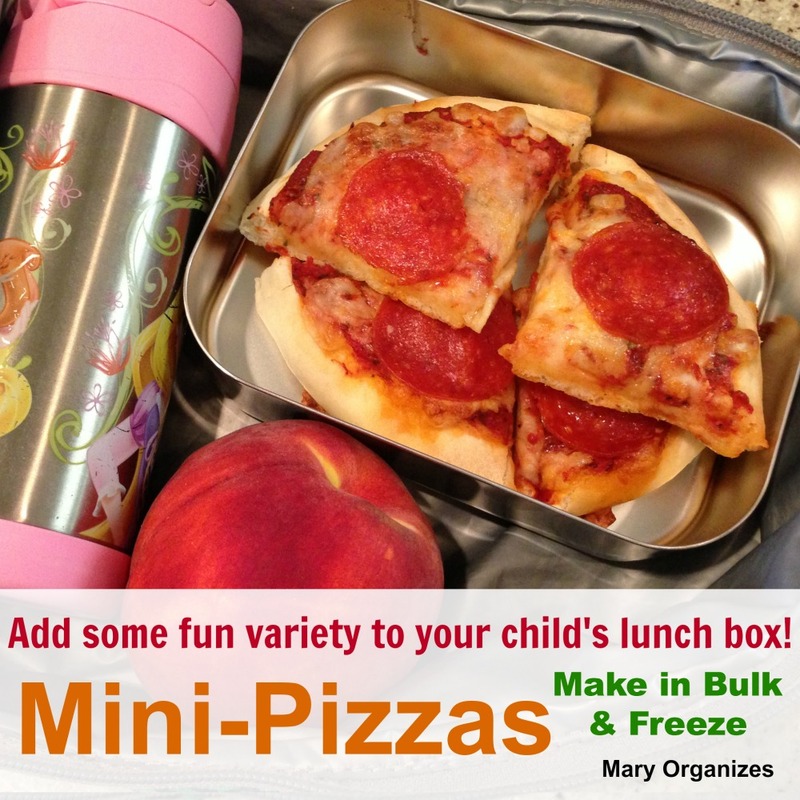 When I was creating the school lunch menu for my children, I decided to add in a pizza day. The easiest way to do this was to come up with a version that I could make in individual sizes and freeze. Prepare your rolling surface. 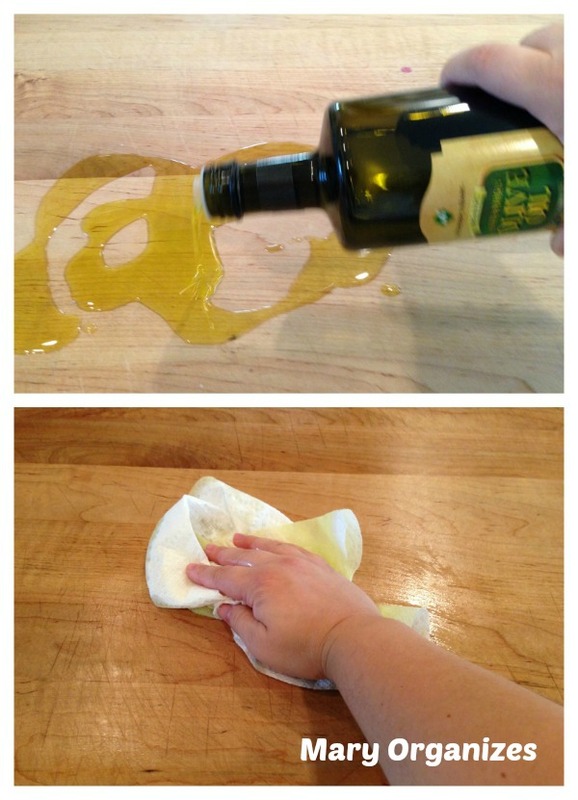 I poured olive oil directly onto my butcher block and rubbed it in. Oil is a lot less messy than flour! I kneaded my dough a few times, then divided into individual globs of dough. I’ve found that the equivalent dough for 1 large pizza crust = 8 mini-pizza crusts. I reserved enough dough for 16 personal pizzas (same amount as 2 large pizzas). Roll each glob into a circular-ish shape. 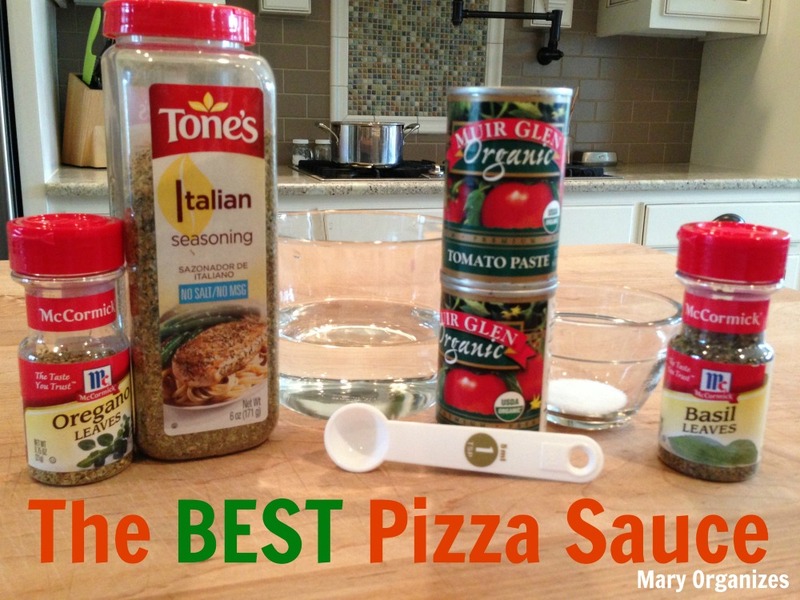 Top with this sauce (it is THE BEST), then add cheese and your choice of toppings. 2 cups of cheese per 8 mini-crusts. Bake on 400 F until crust is golden brown, approximately 13 minutes, but watch and use your best judgment with your oven. Why bake? I want to be able to pull these out of the freezer and put into my kids lunch. If I were making frozen pizzas for dinners, I would freeze un-cooked, but still with it already raised and made. 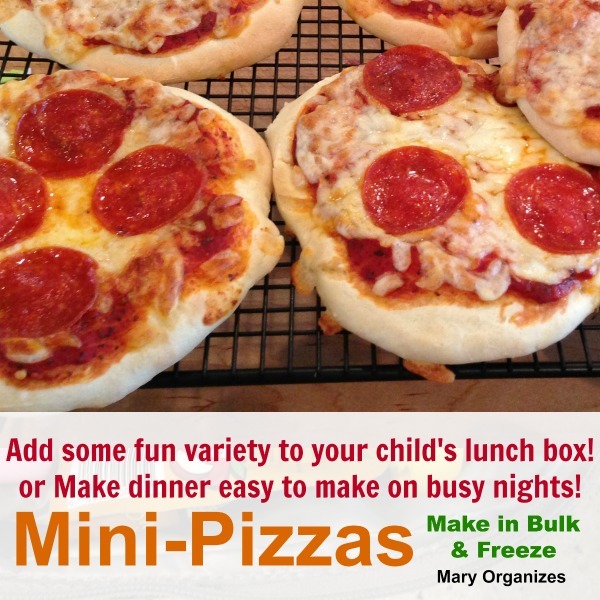 This box of 16 mini-pizzas will last five weeks, eating one day per week. That wasn’t so bad, was it?! You could totally do it! If your school is peanut free, isn’t this a great alternative?! And you could pull them out on a busy night. These will always be in my freezer now! You are welcome, world! 🙂 And now do you want to see it all cute in the lunchbox? Pack your lunch and watch the savings add up! We pack our girls lunch every day. Not only does it give me control over packing healthier options that I know they’ll eat, it also saves a ton of money. School lunches here are $2.20. Five days a week for one child would be $11. Five days a week for three kids would be $33. That is $132 every four weeks if I bought my three girls lunch. Um, no thanks, I can do much better than that. I usually send pizza on Fridays, because that is when their peers are also usually eating pizza from the cafeteria line. Let me know if you give it a try! I hope it works for you like it does for us. 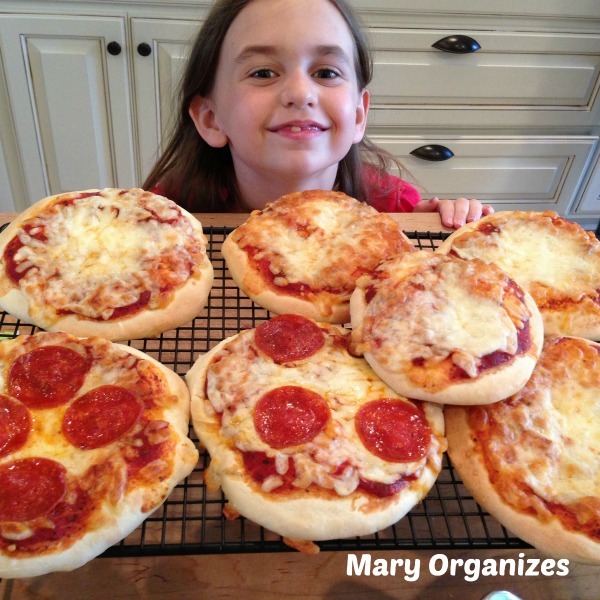 Hi Mary, love this idea very much for my daughter’s school lunch! What’s the temperature for 13 minutes in the oven? Thanks so much for sharing! 400 F. Sorry I missed that! Hope your daughter likes it! 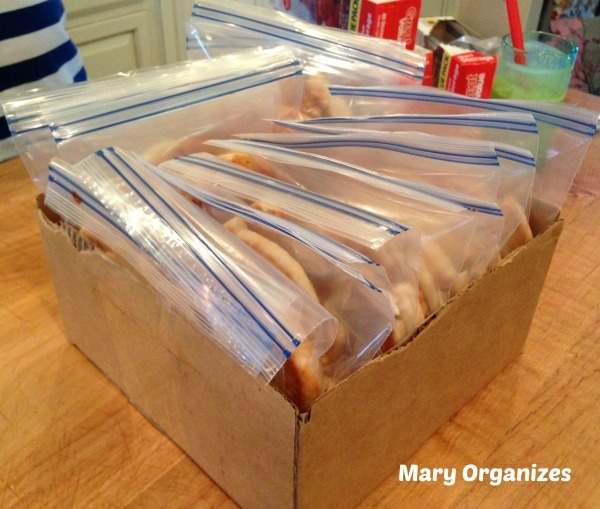 When you put them in lunch boxes, do you put them in there frozen or do you warm them up? Thawed in the fridge over night, still cool in the lunch box. My kids said they turned out great! so they eat the pizza cold? It is warm-ish by lunch time, but yes. They don’t seem to mind at all. 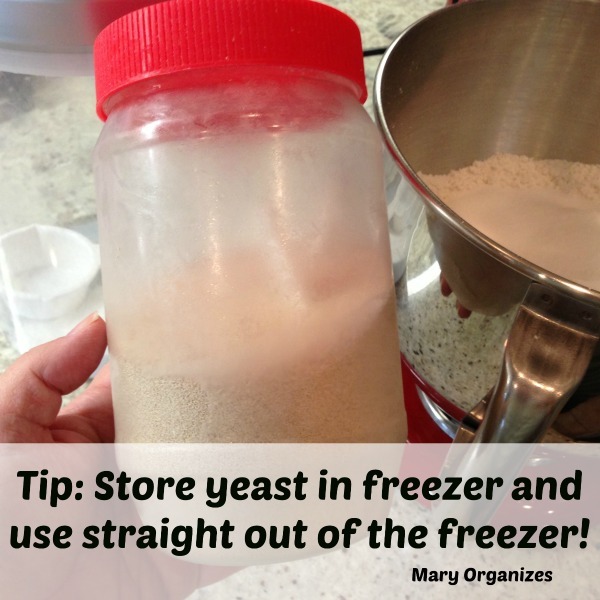 I’m stocking the freezer this month in anticipation of Back to School in September! This is exactly what I was looking for! 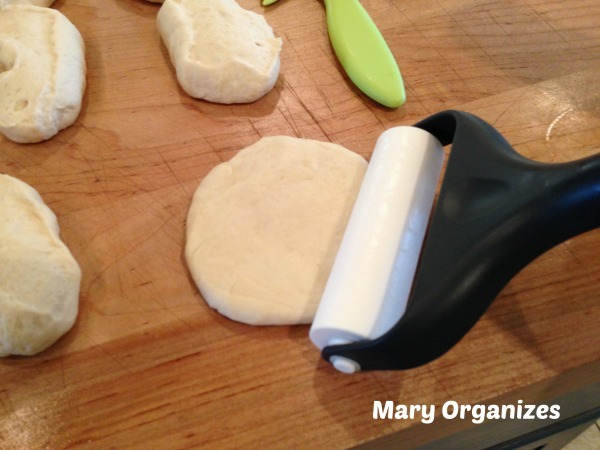 1 question – do you mix the dough, let it rise as a whole for an hour (as directed in the linked recipe), then divide & let them rise again for the 10 min period OR do you mix, divide & let the mini doughs rise for an hour? Thanks & looking forward to making these soon! 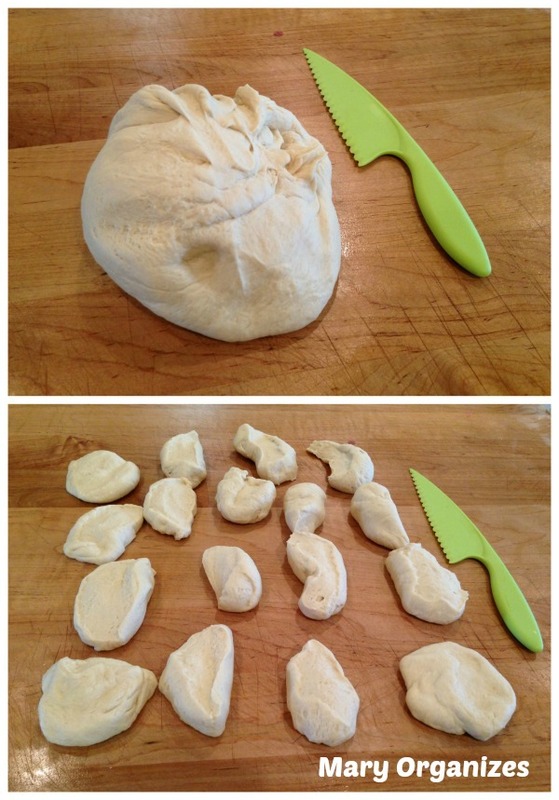 I rise the first time in the dough ball, and then again when they are sectioned off into little pizzas. That portion of the rising can happen before/during/after the toppings are added, but before they are baked.